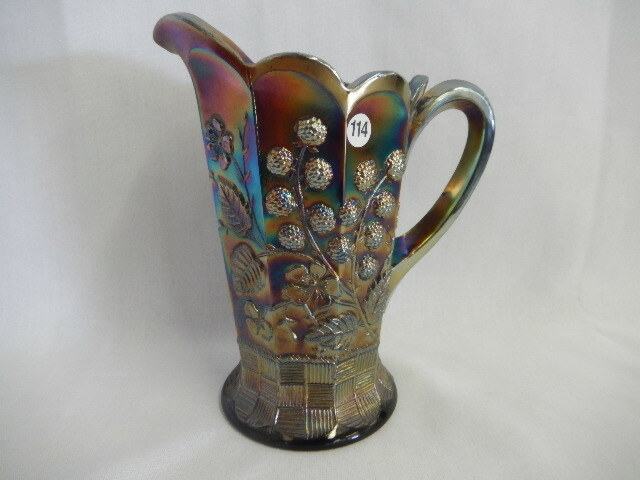 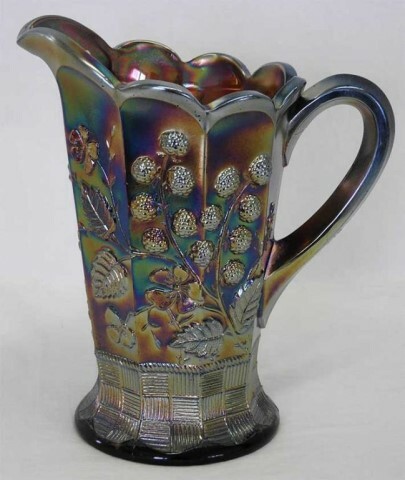 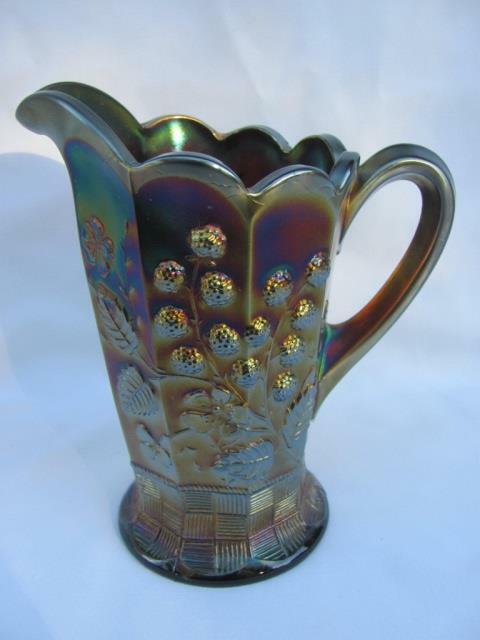 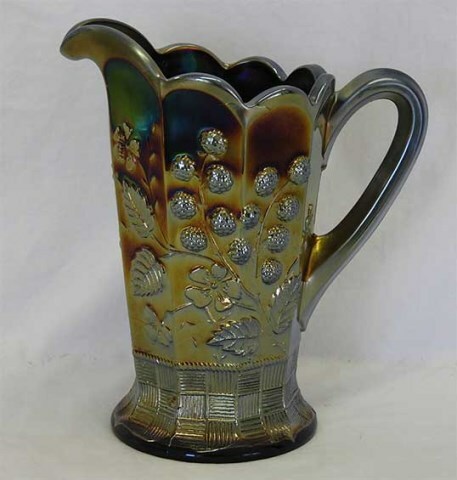 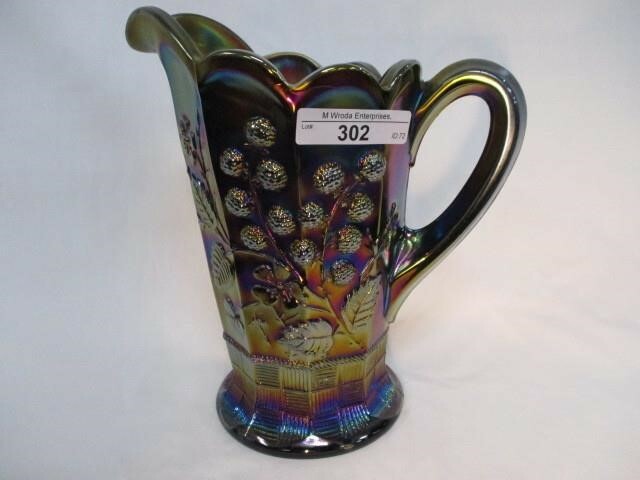 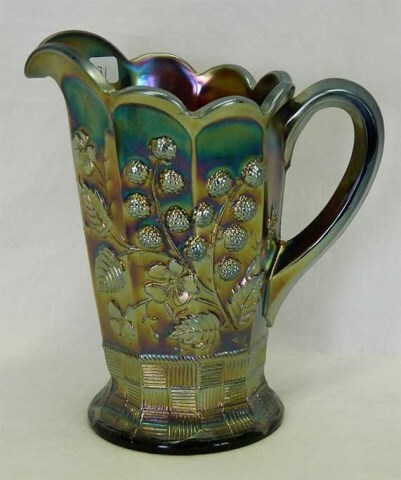 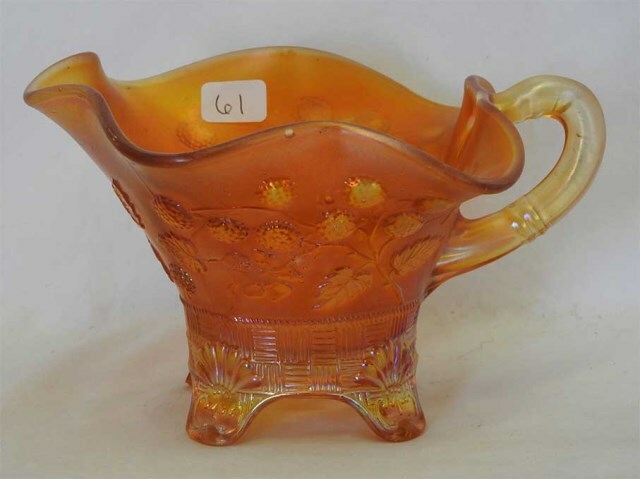 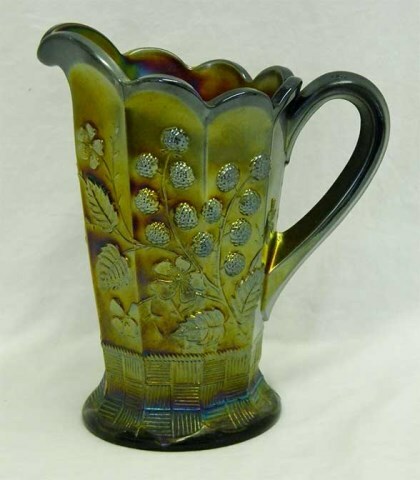 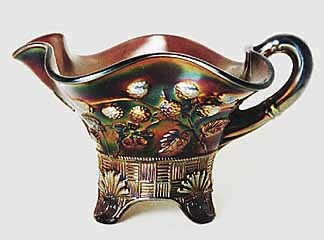 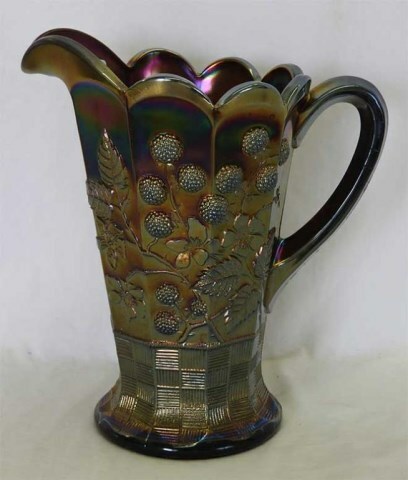 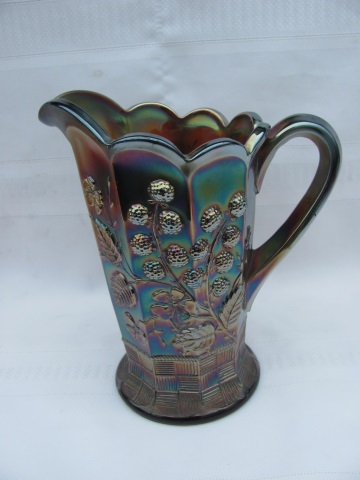 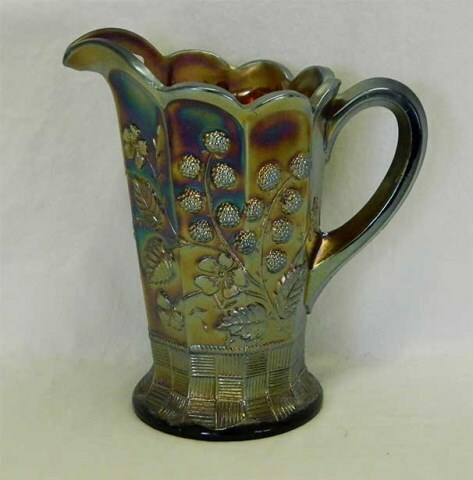 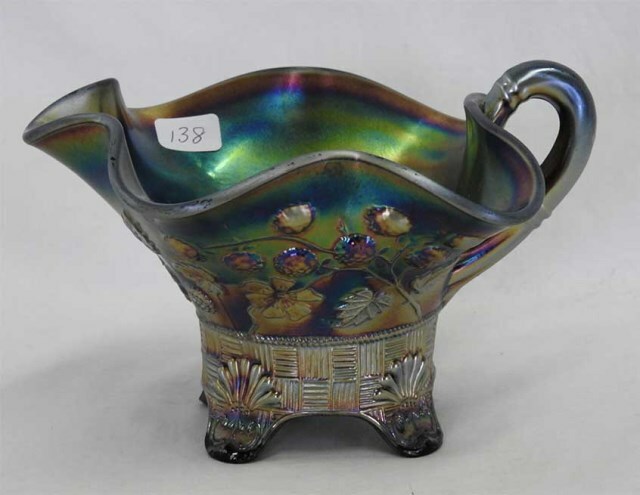 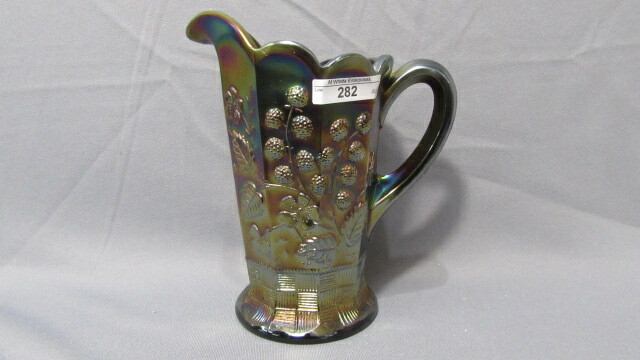 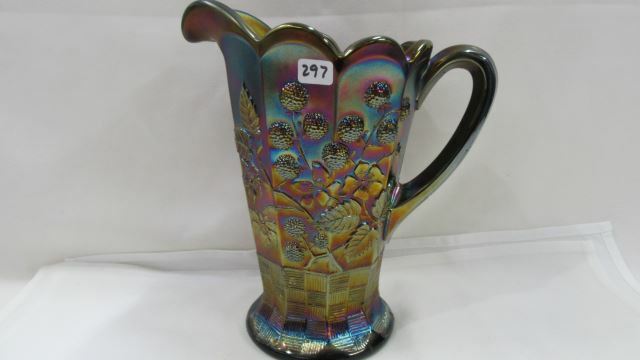 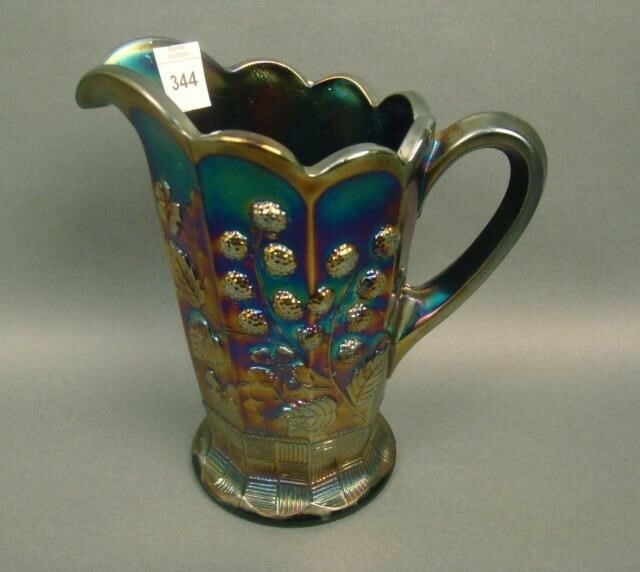 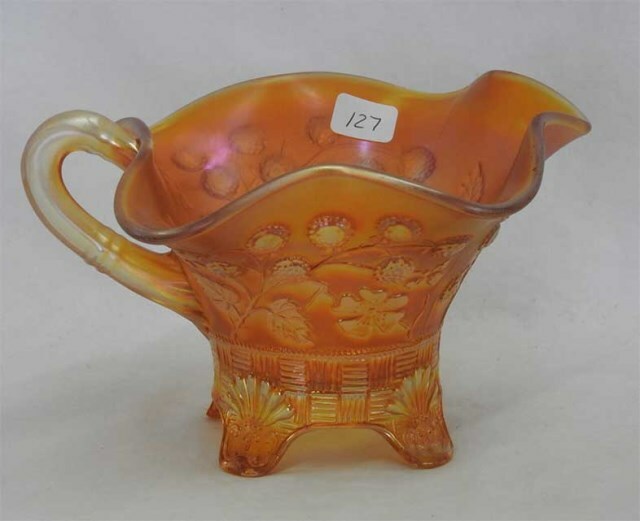 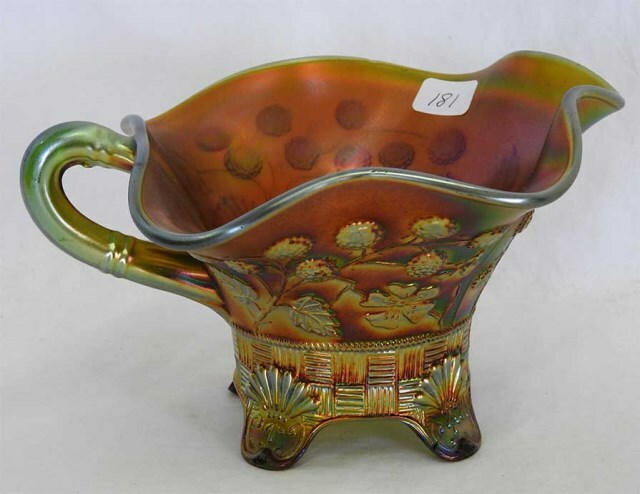 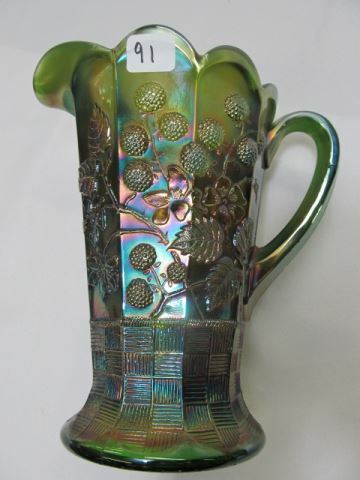 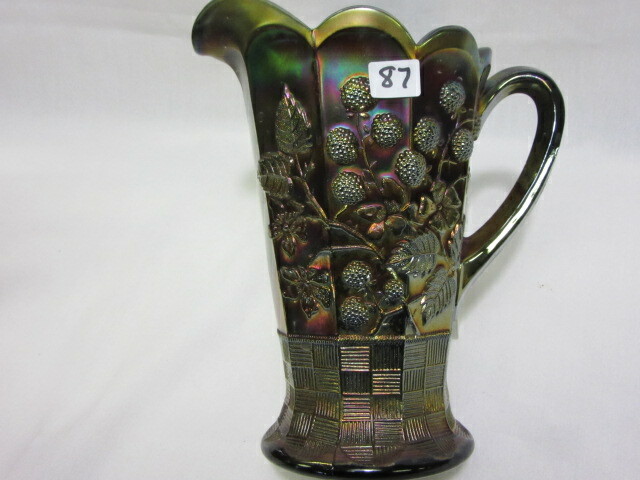 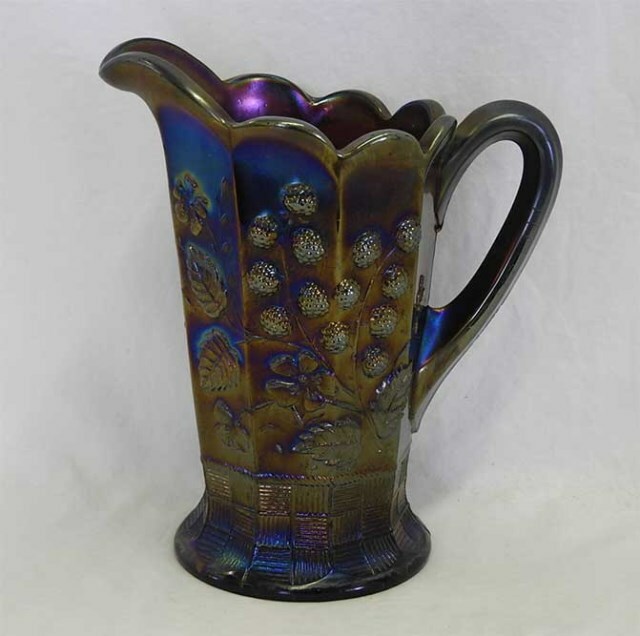 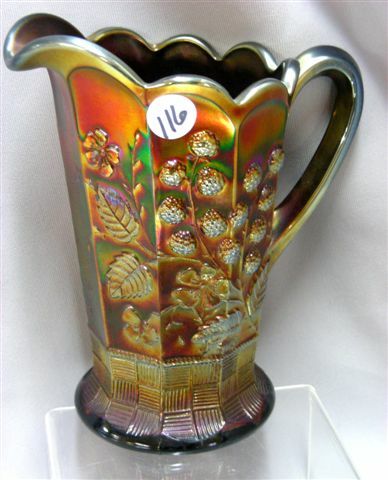 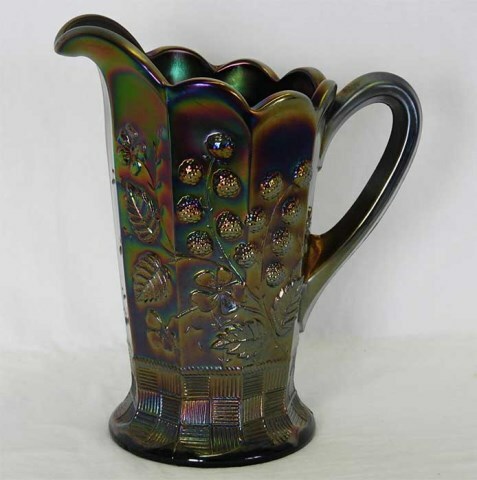 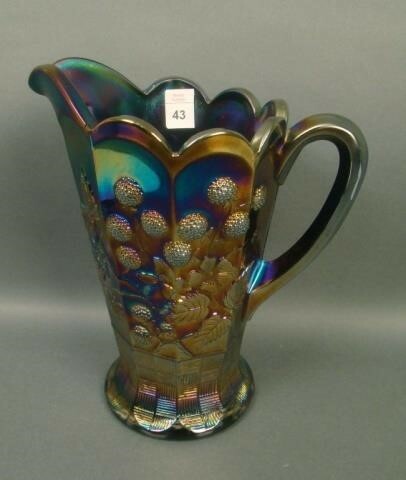 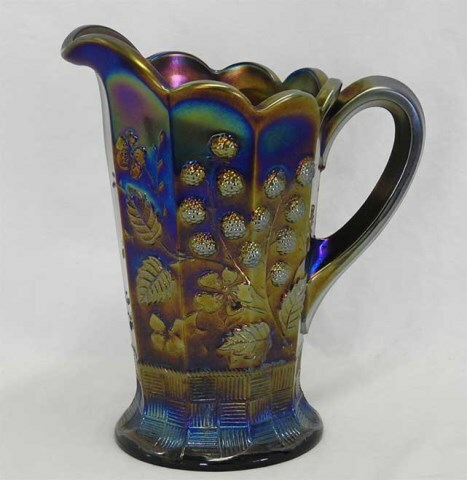 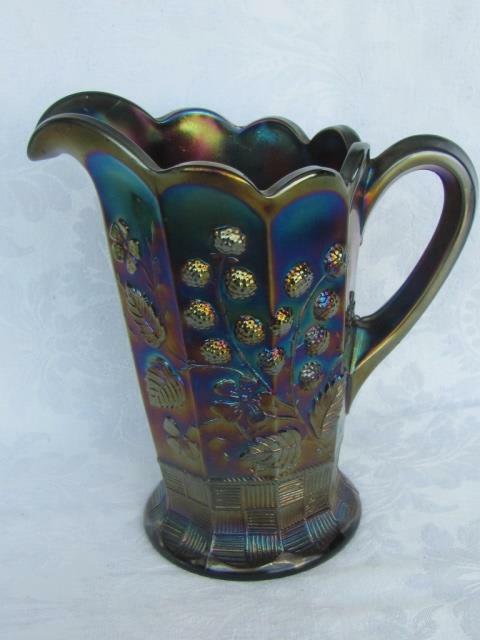 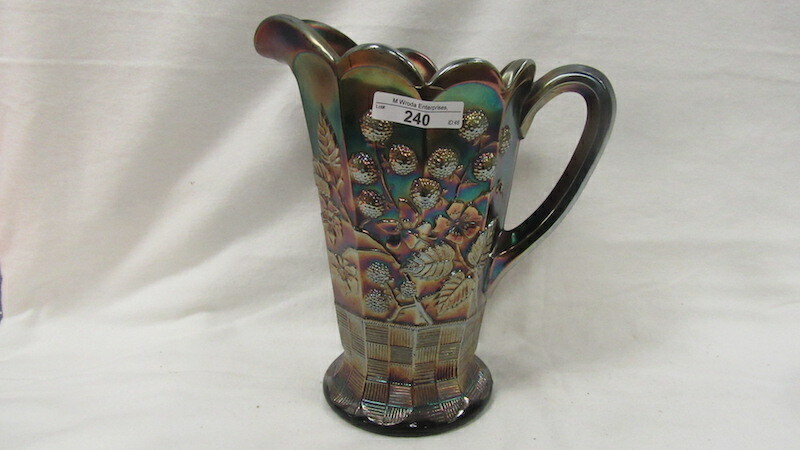 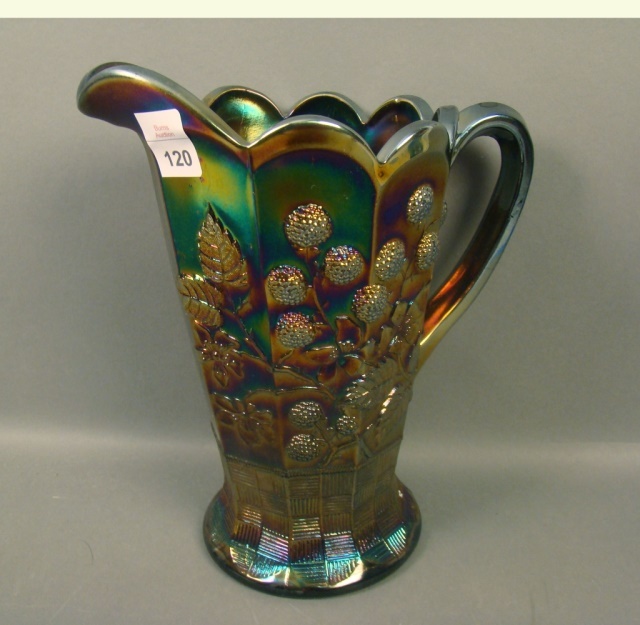 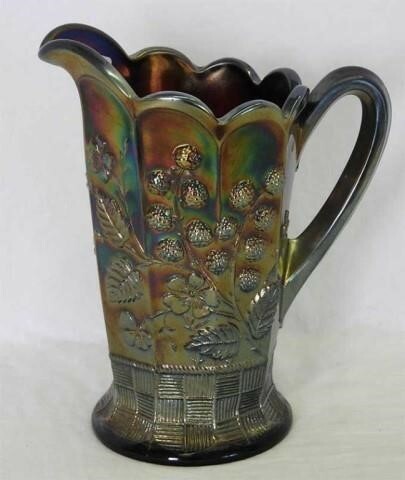 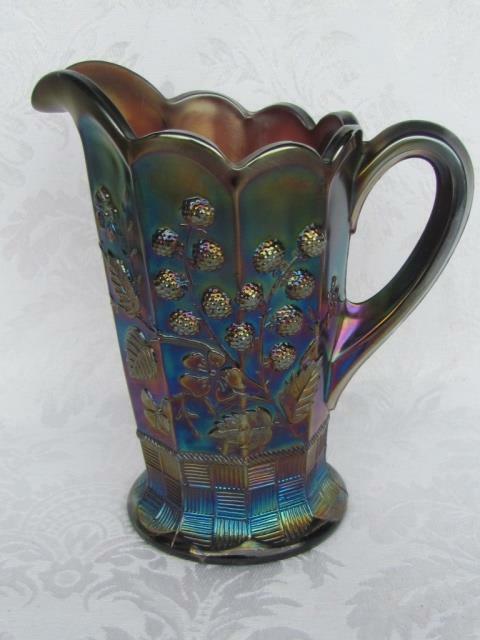 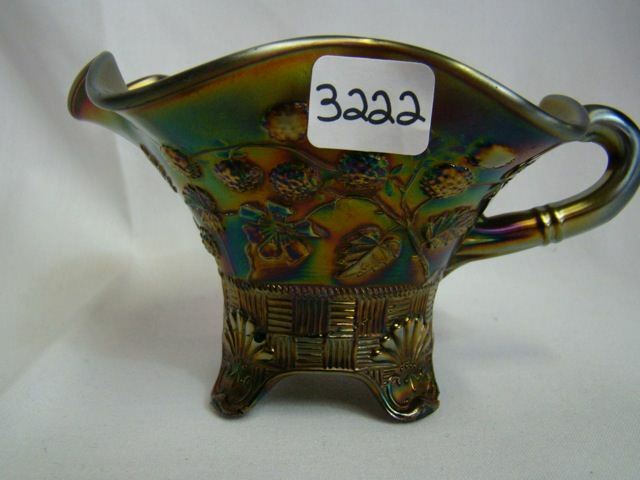 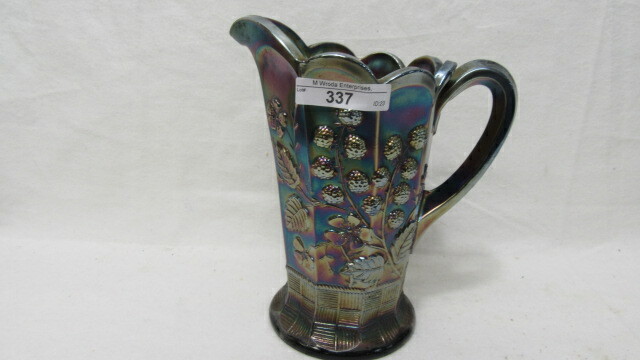 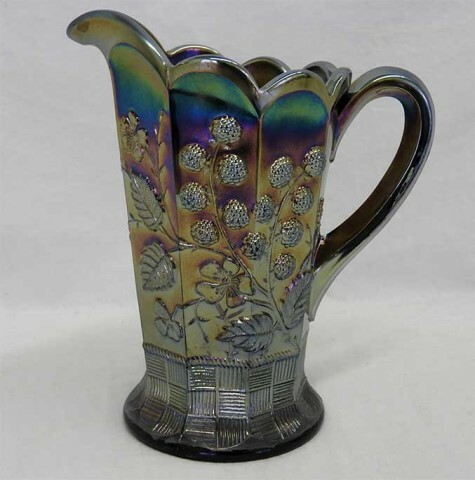 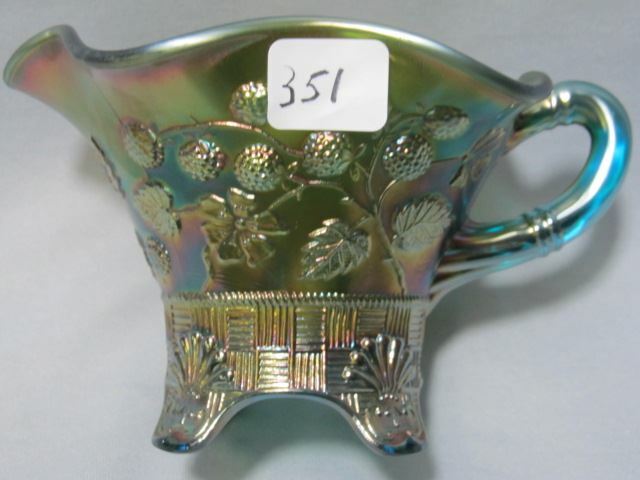 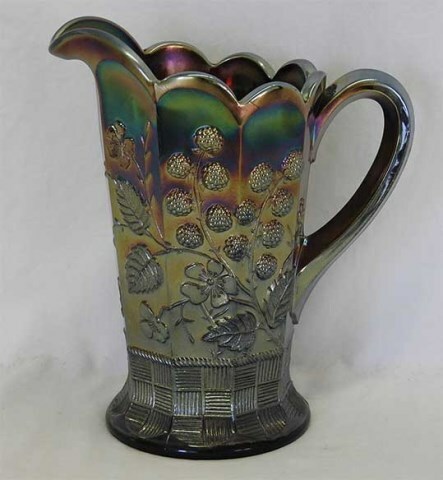 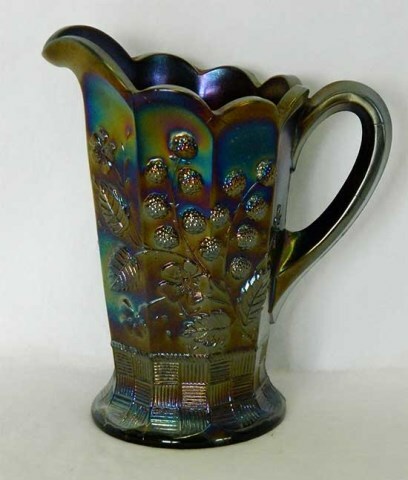 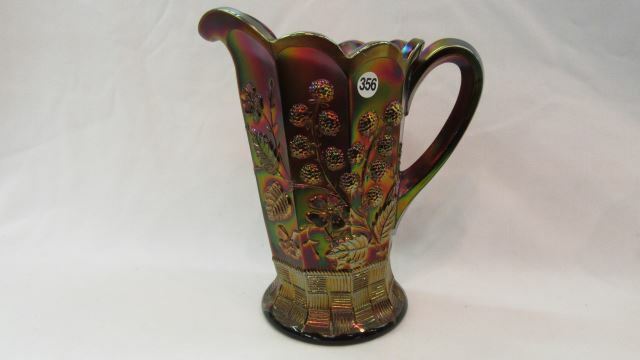 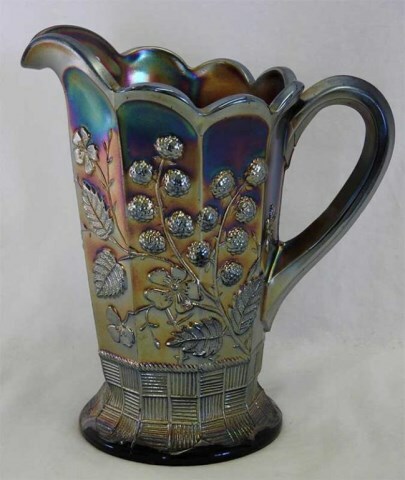 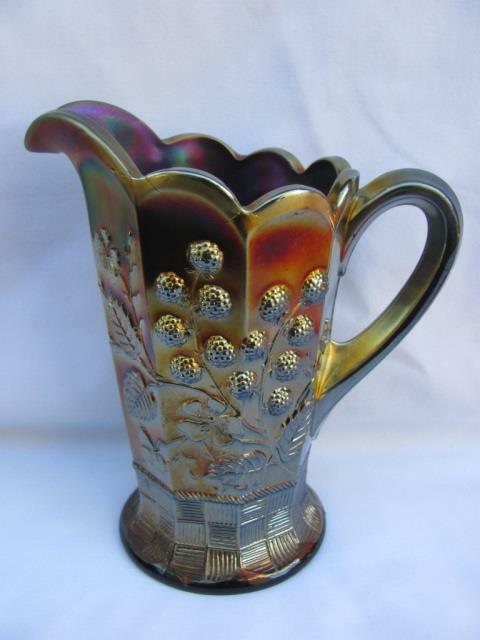 Northwood's Raspberry pattern underwent production over many years and is found in water sets, milk pitchers, compotes (sometimes called Blackberry), and the gravy boat or occasional piece. 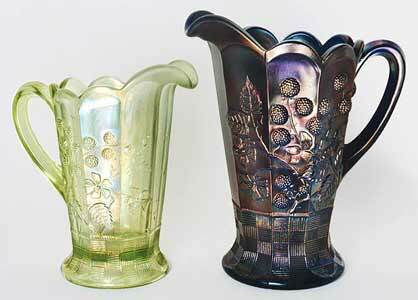 The milk pitcher, above left in lime green, is 7 1/8 inches tall while the water pitcher is 9 inches tall. 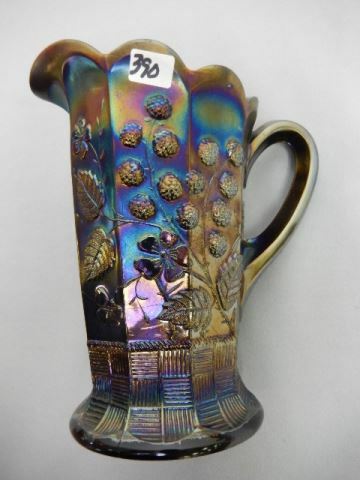 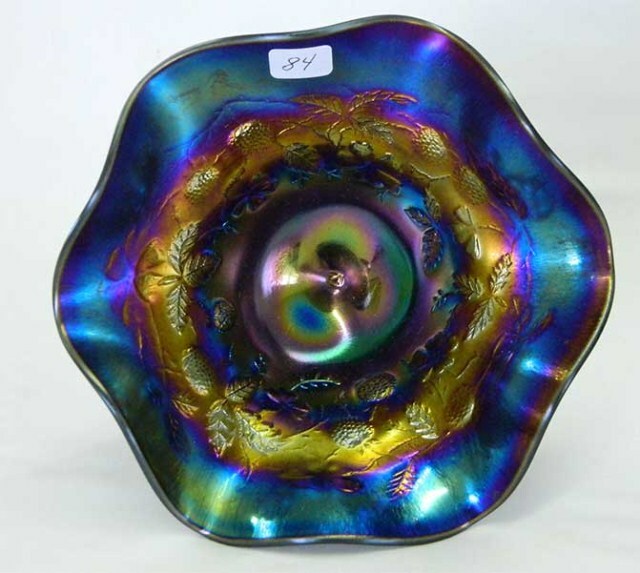 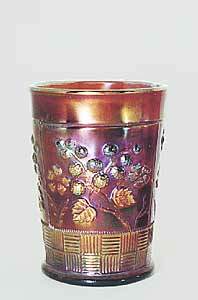 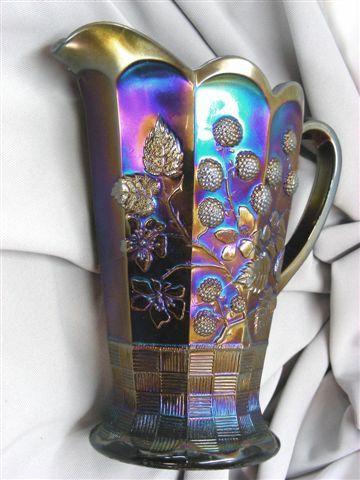 Tumblers are seen most often in the amethyst shown above. 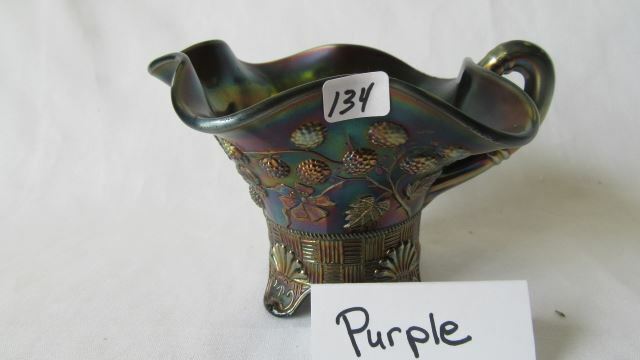 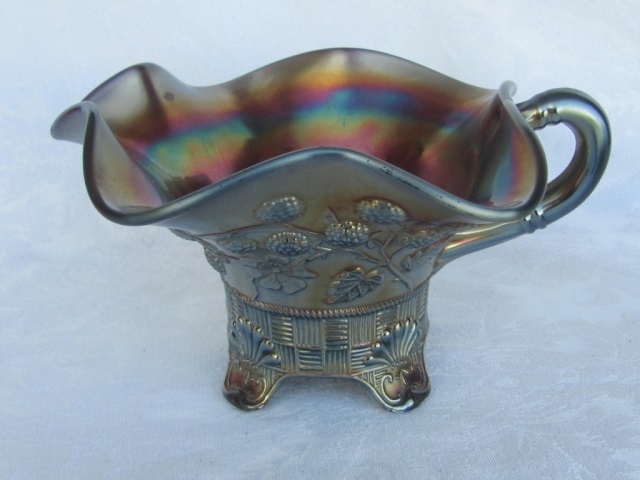 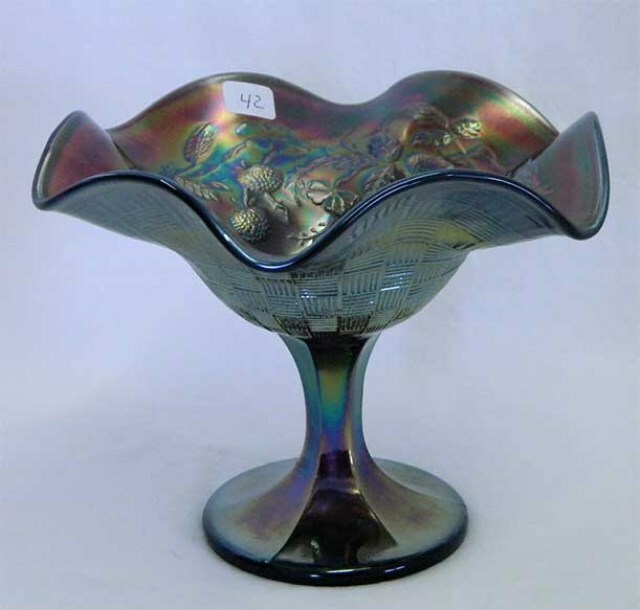 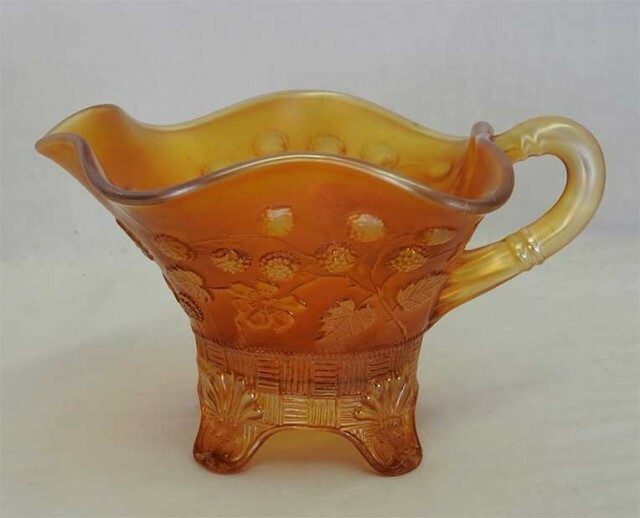 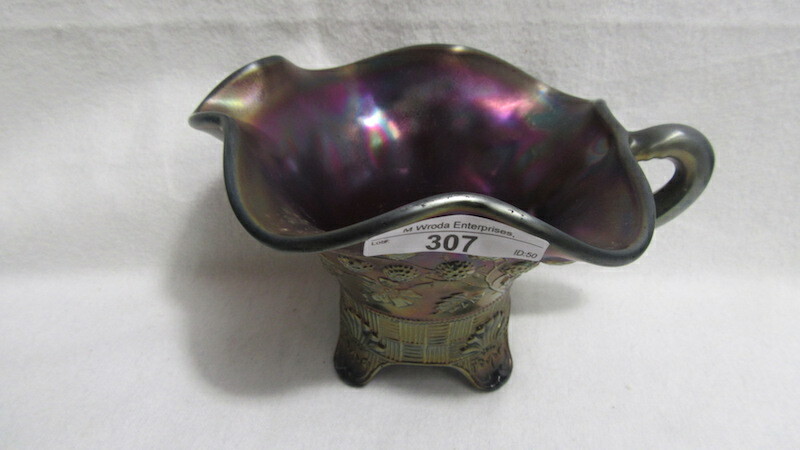 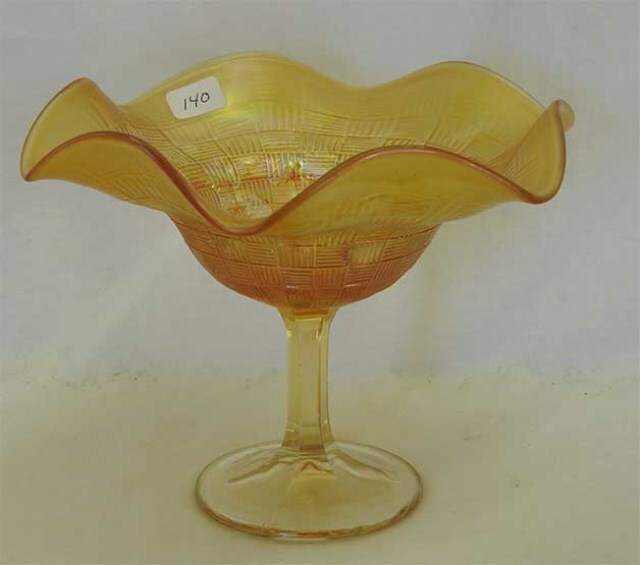 Some collectors refer to the compote above as Blackberry but, after reviewing the pattern it almost for certain fits as part of Northwood's Raspberry line, so it is included here. 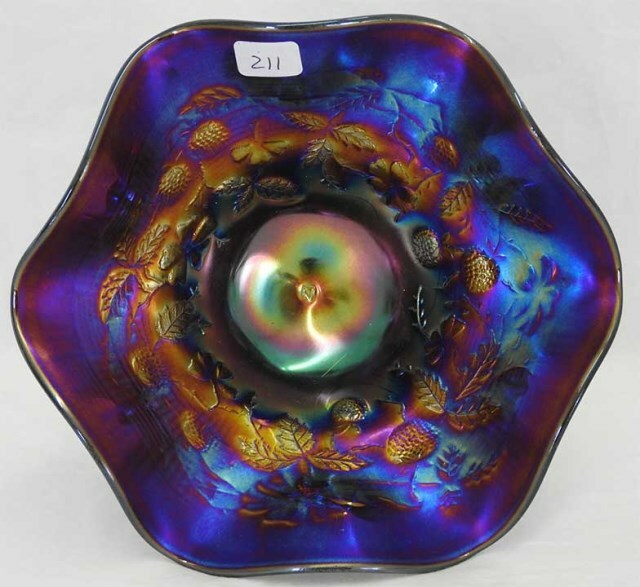 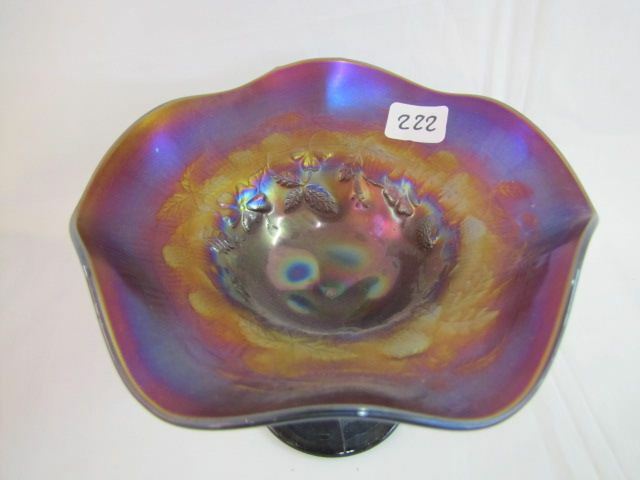 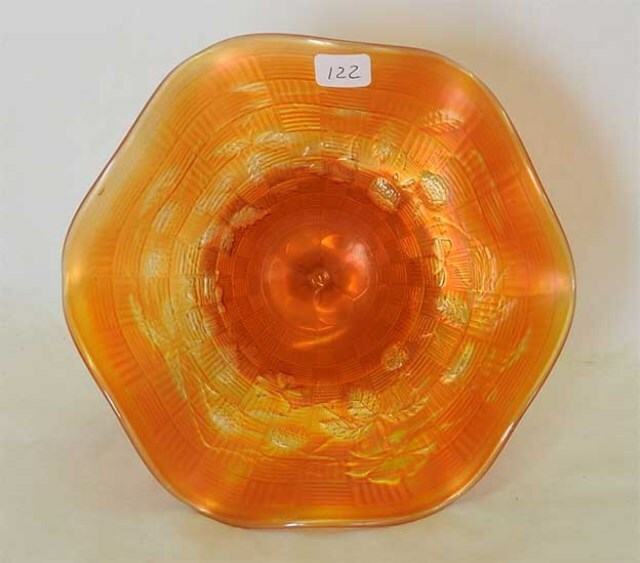 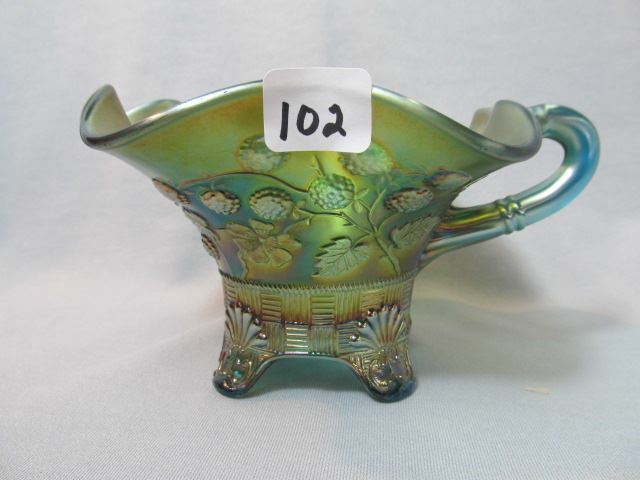 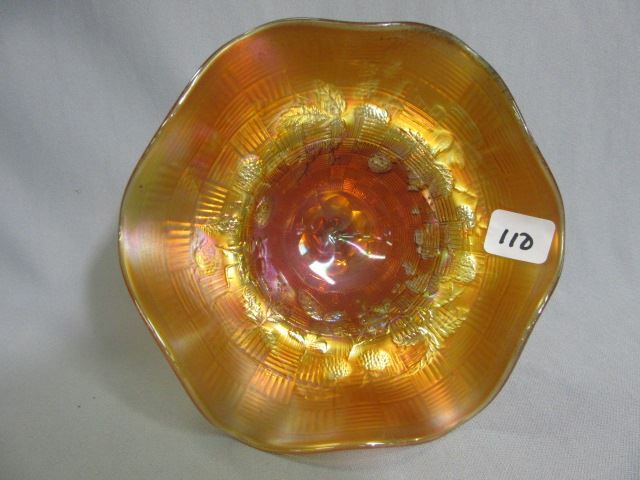 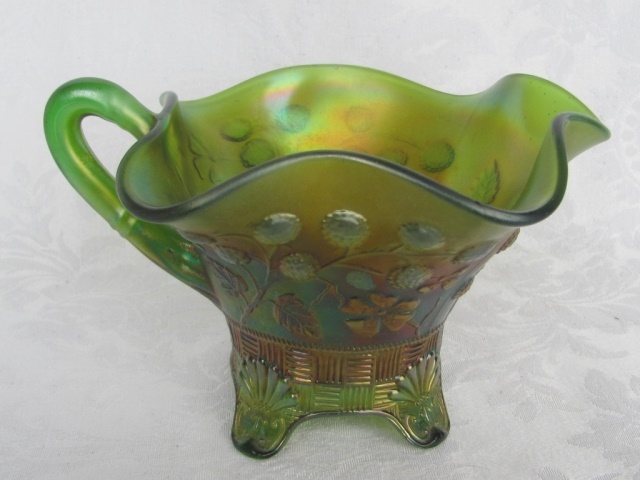 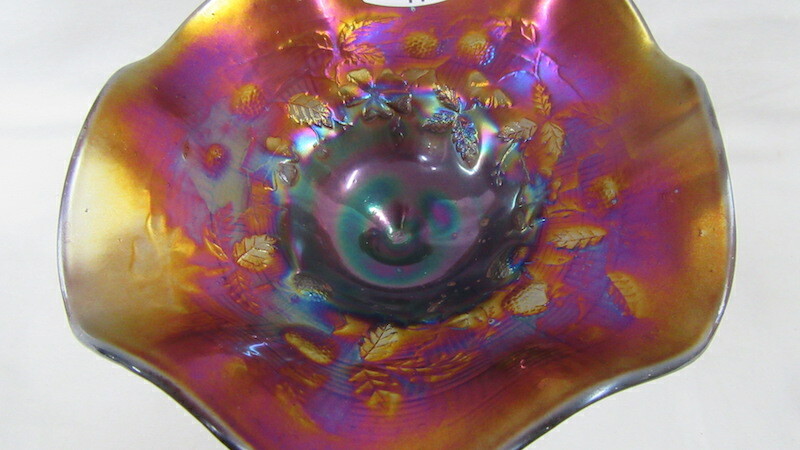 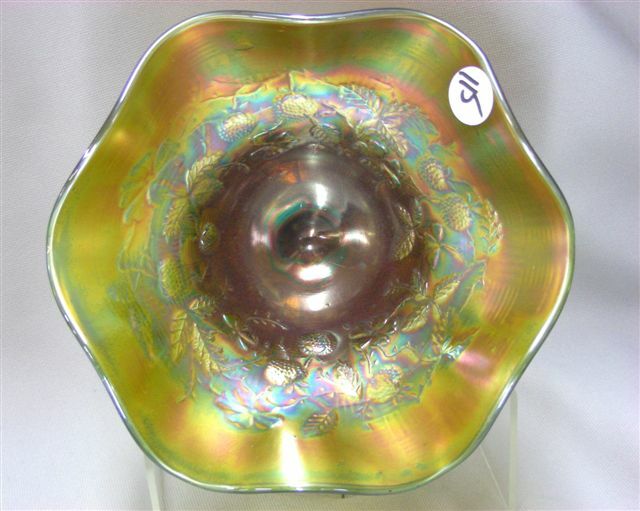 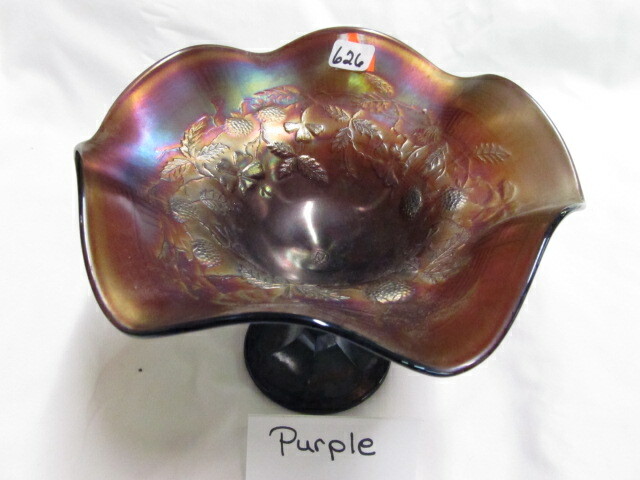 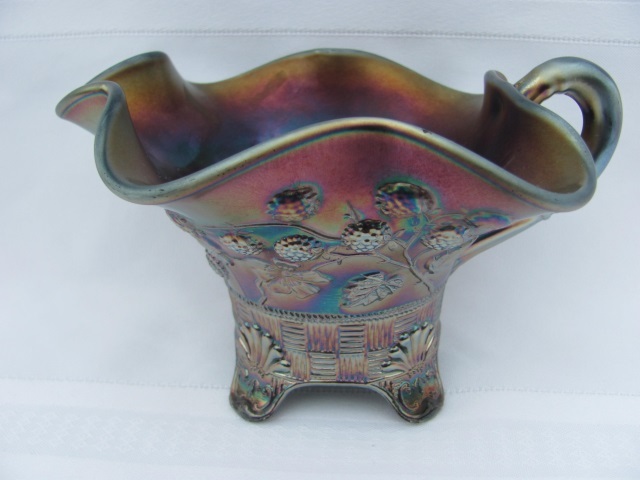 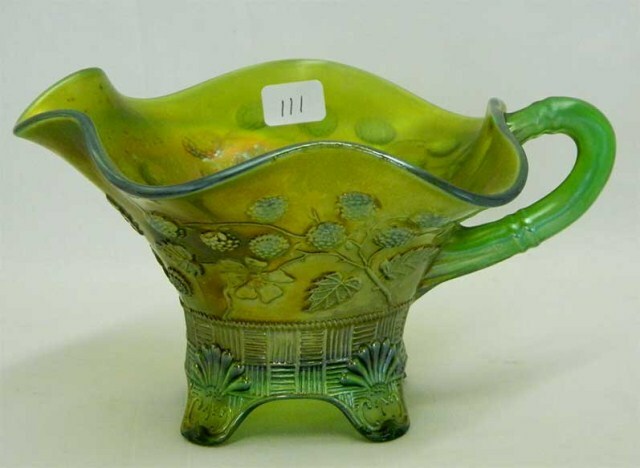 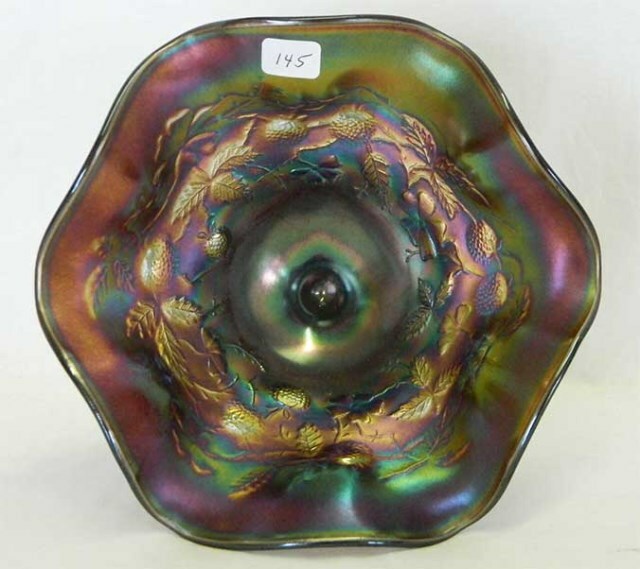 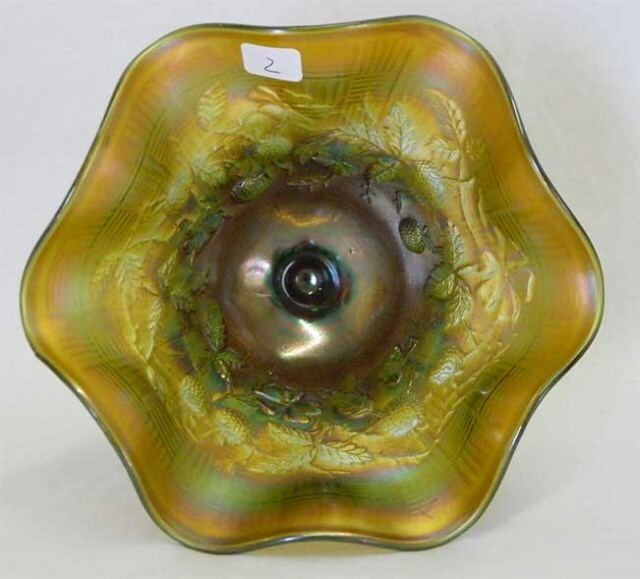 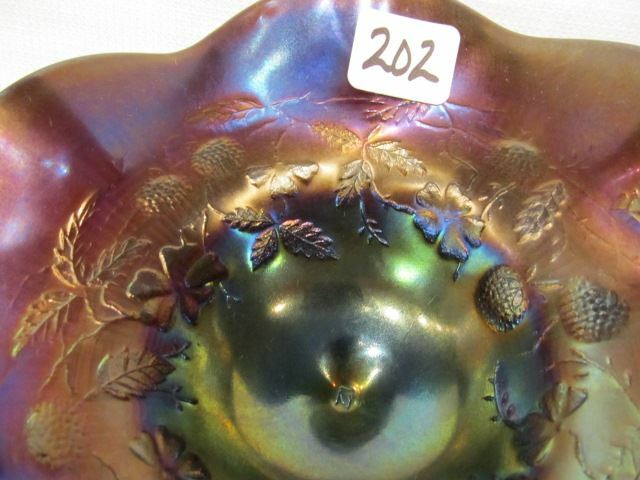 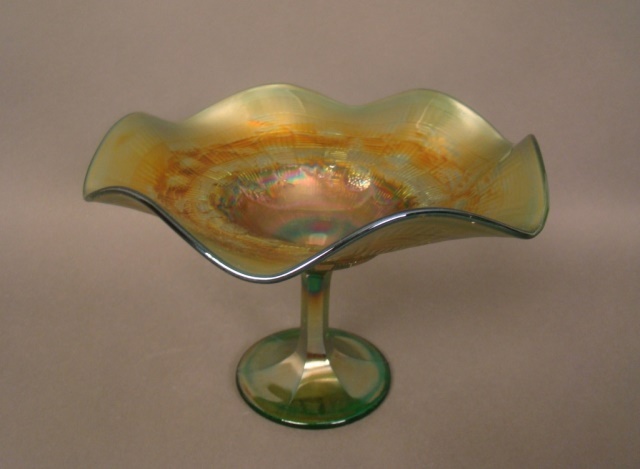 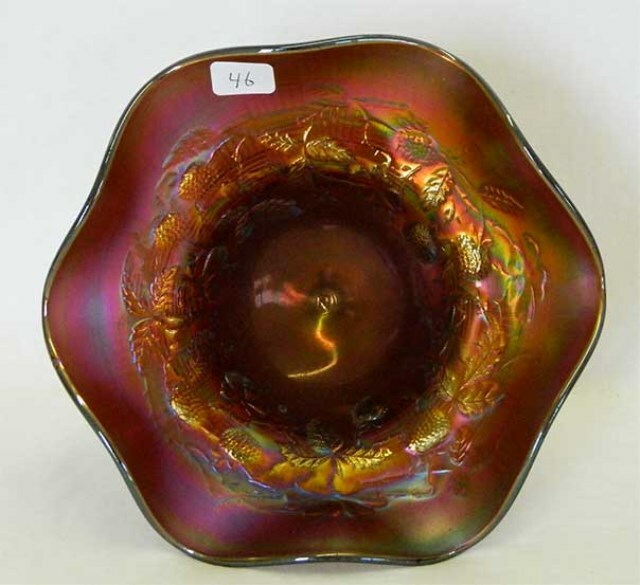 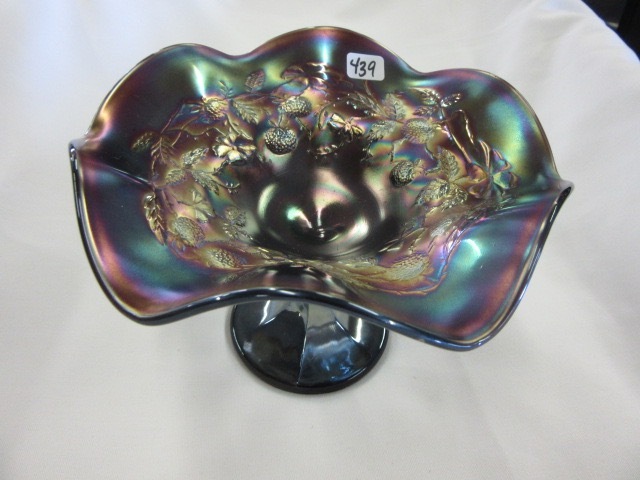 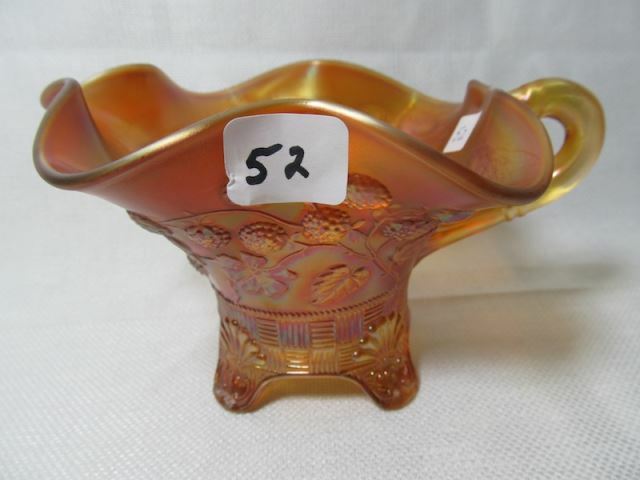 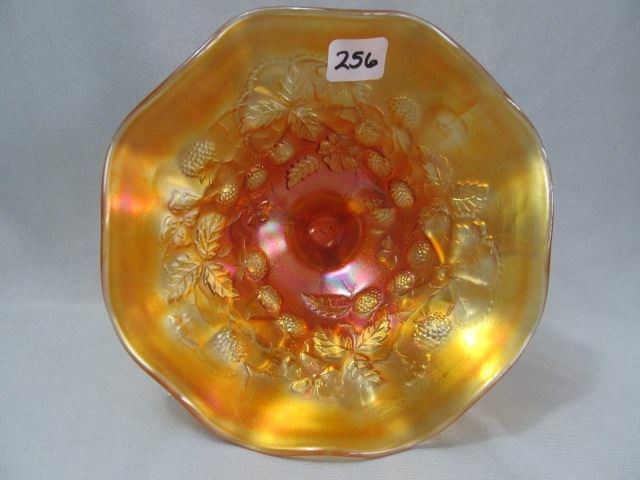 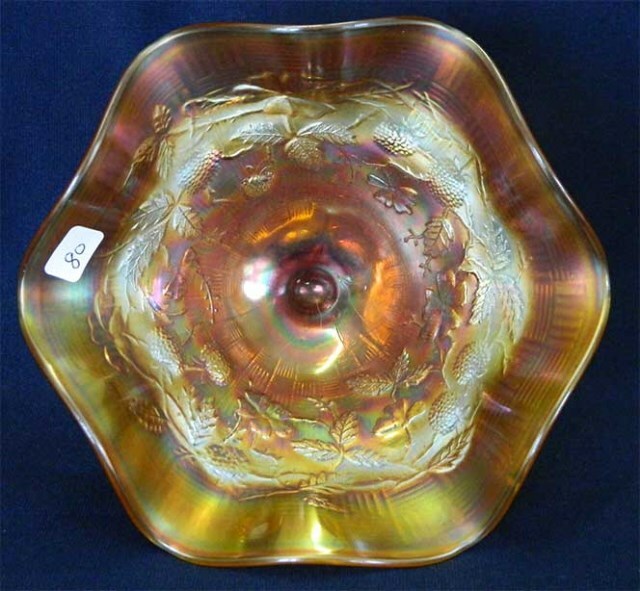 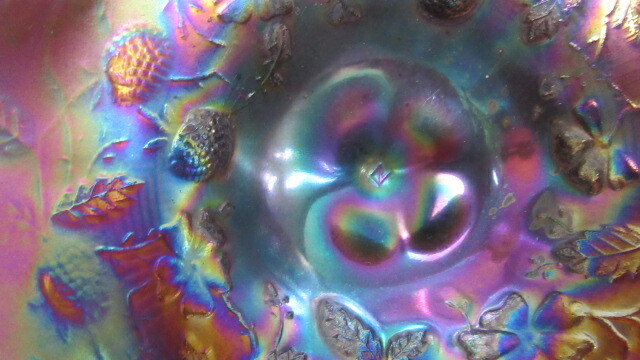 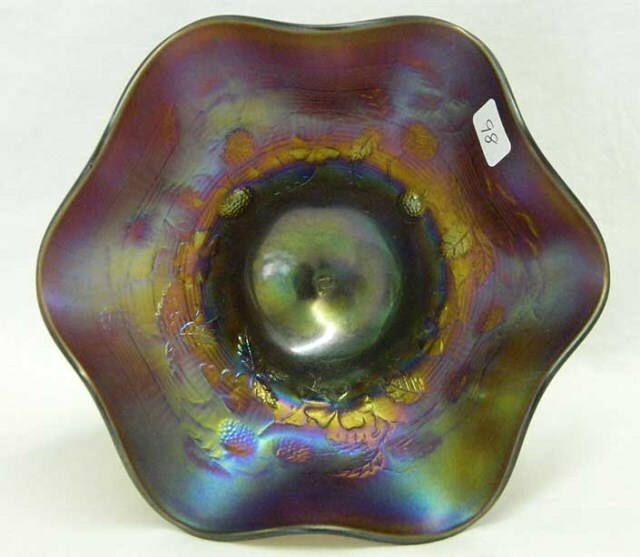 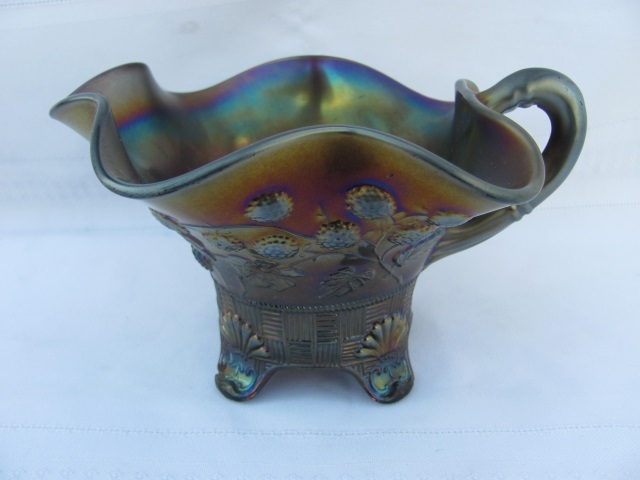 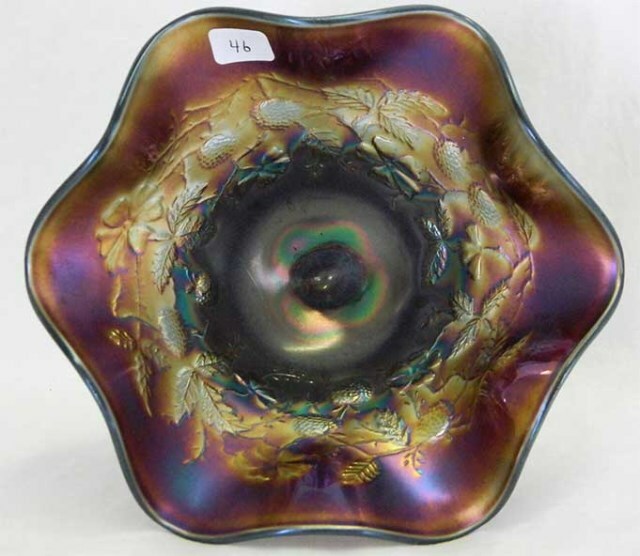 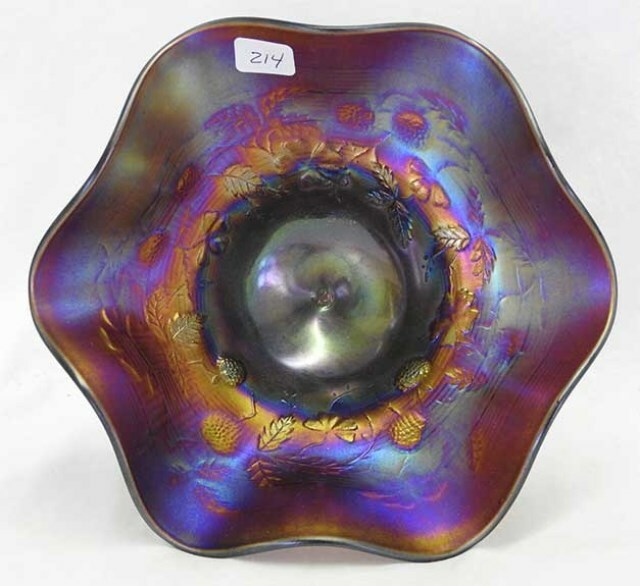 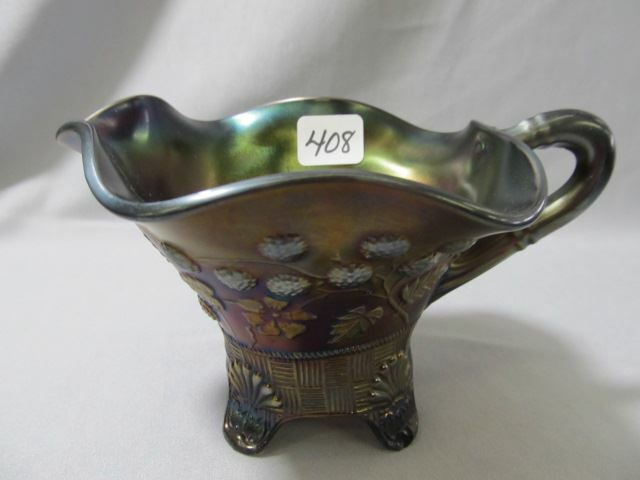 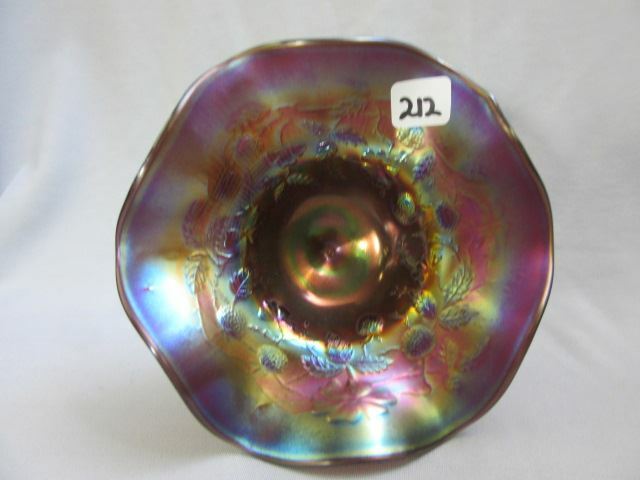 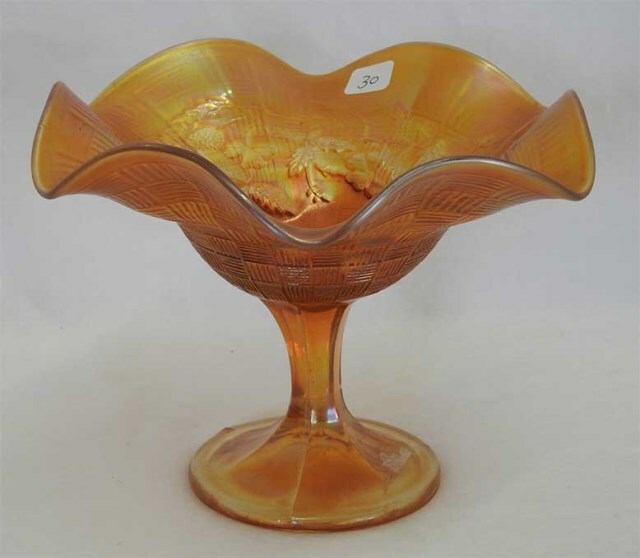 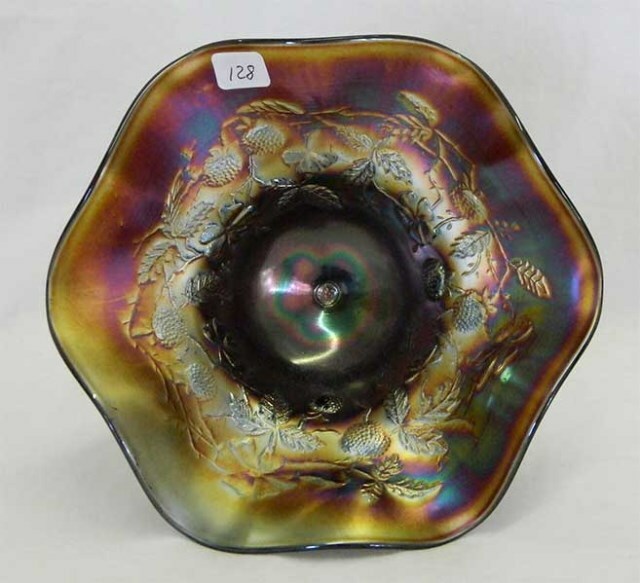 The berry pattern is also found on some of the Daisy and Plume three-footed bowls and rose bowls. 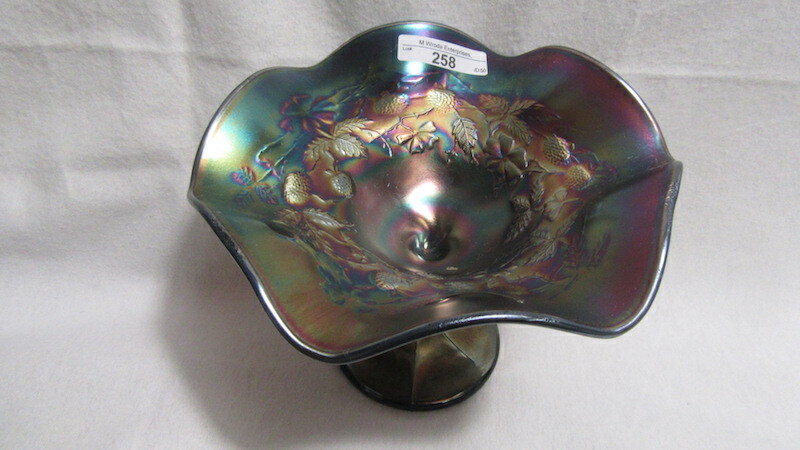 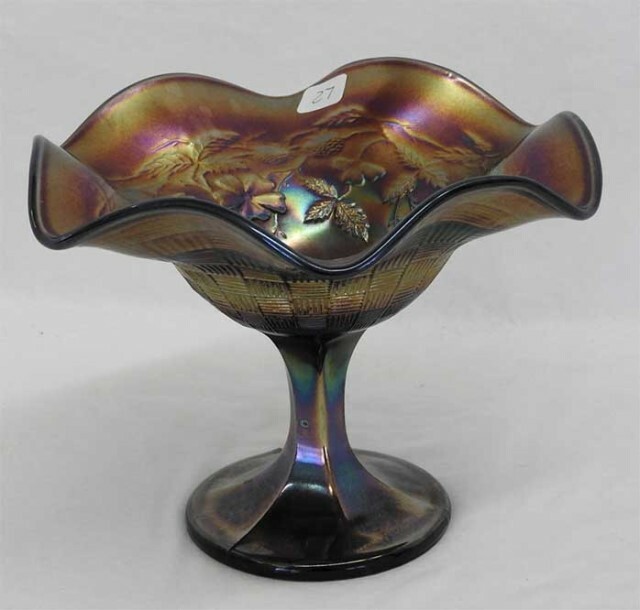 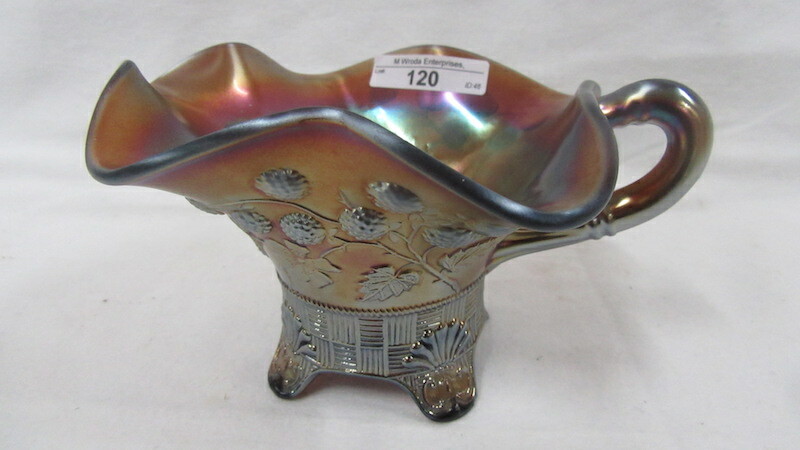 This compote has Northwood's basketweave exterior. 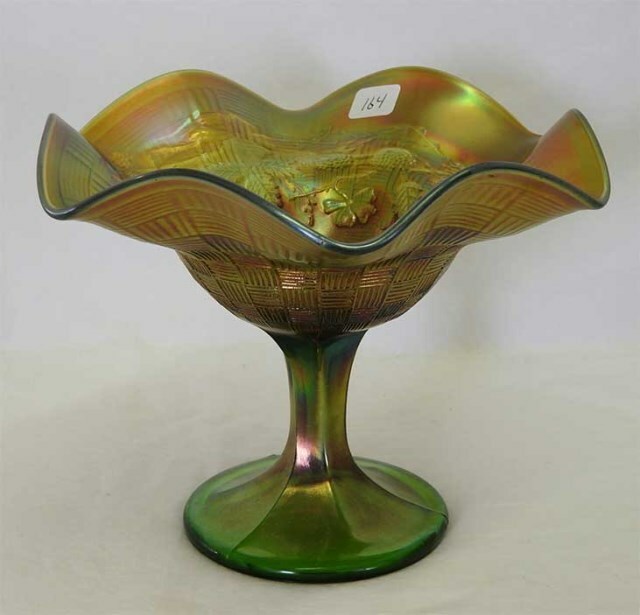 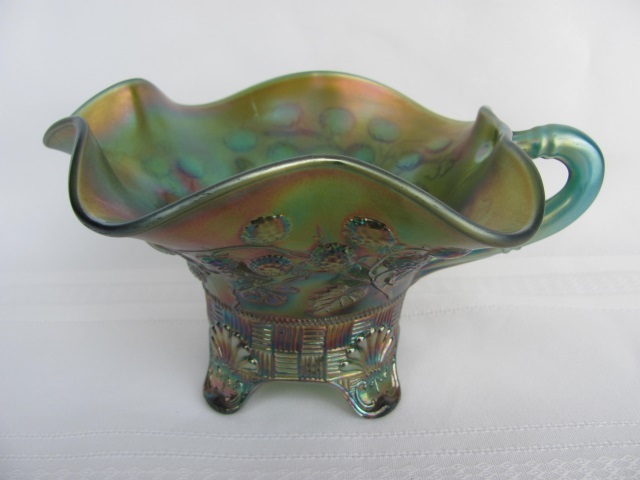 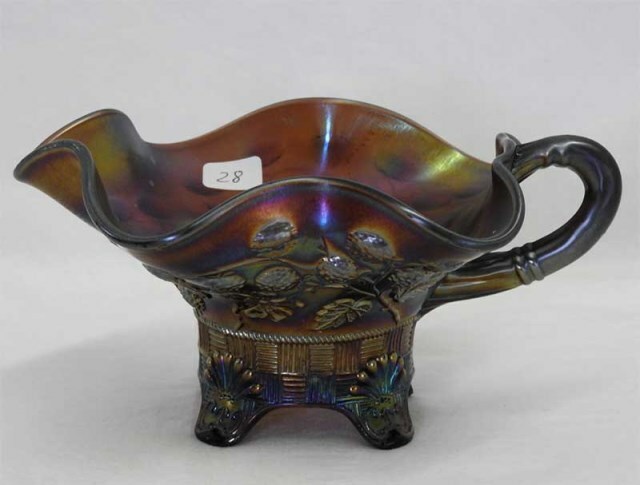 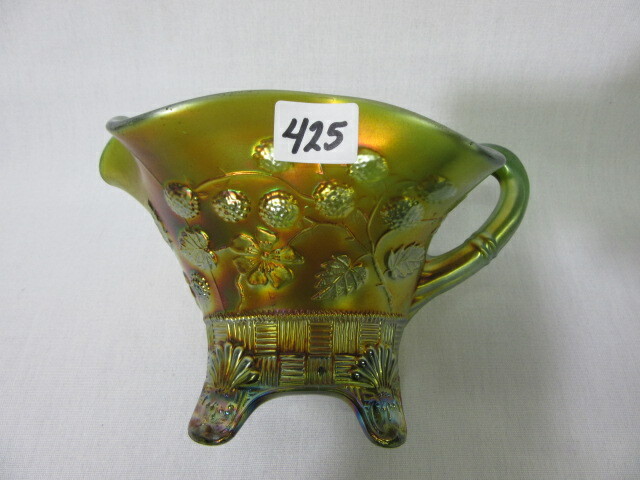 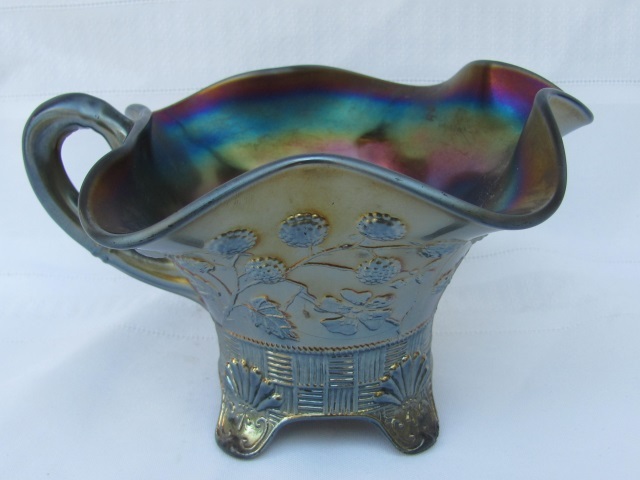 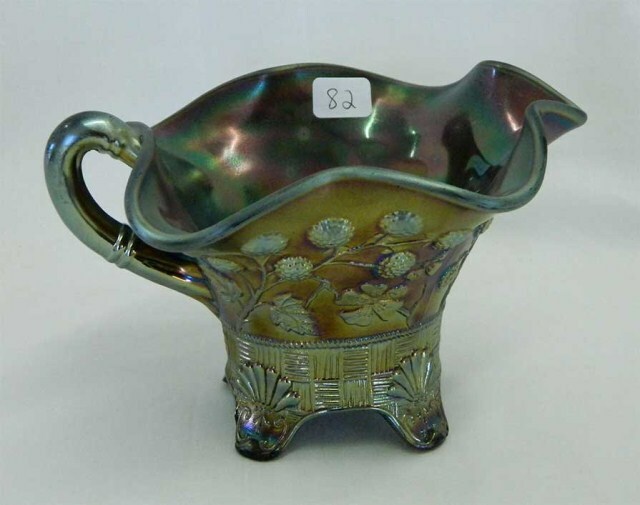 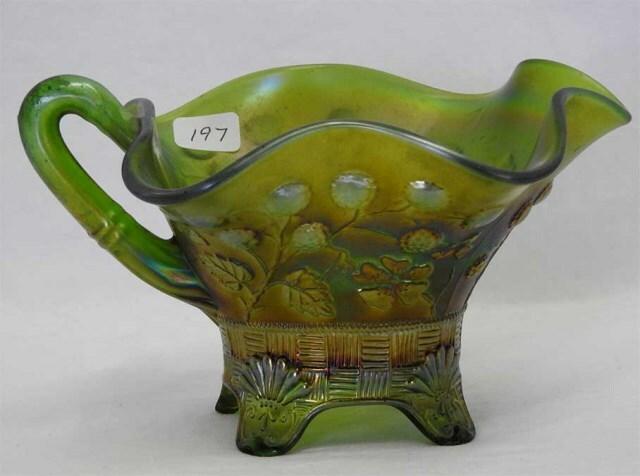 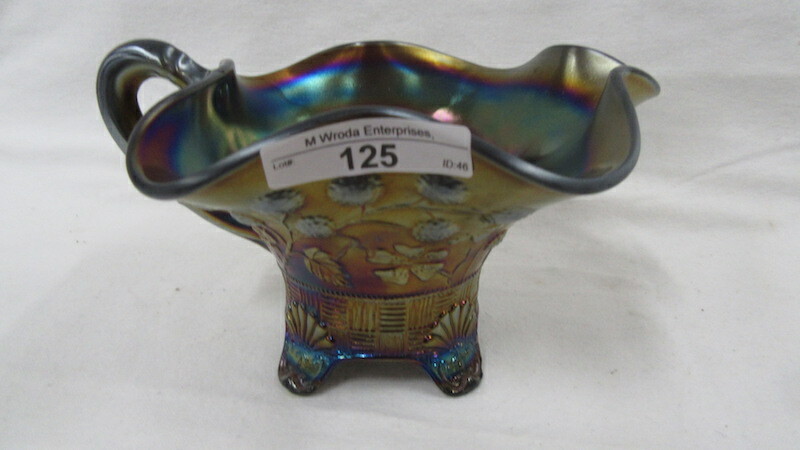 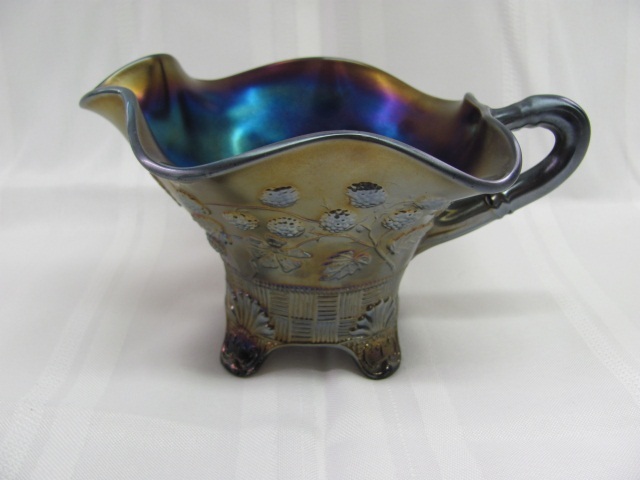 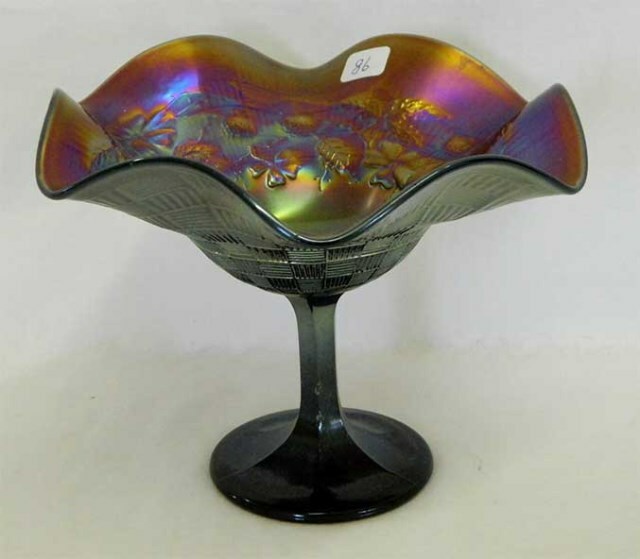 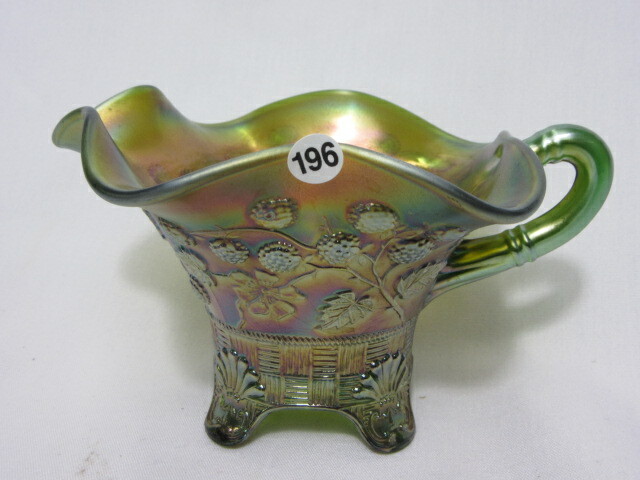 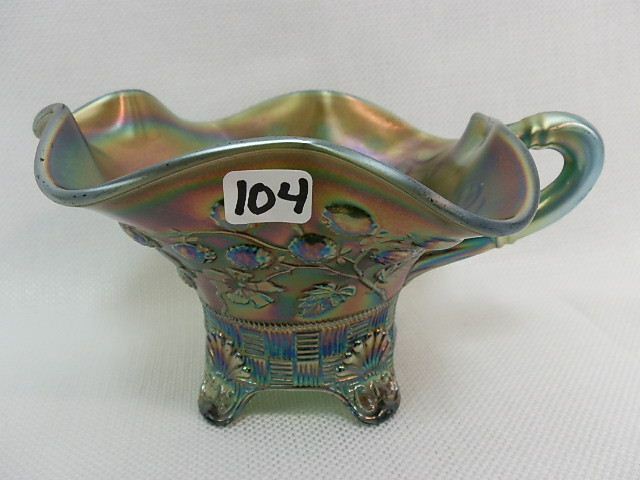 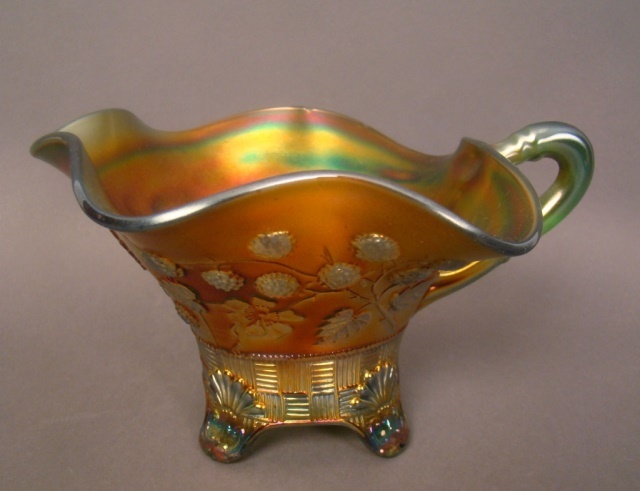 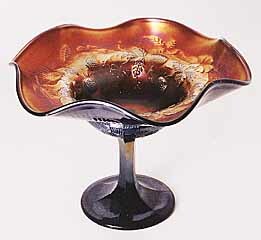 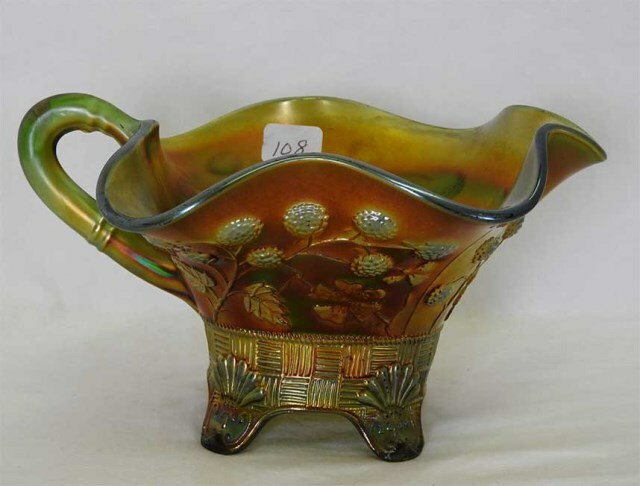 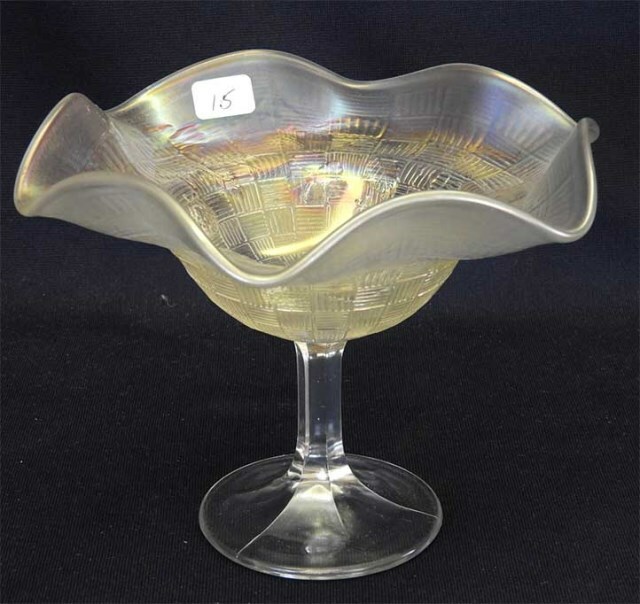 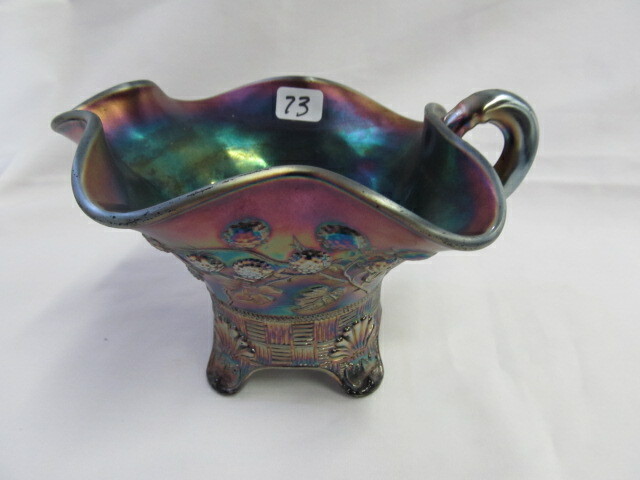 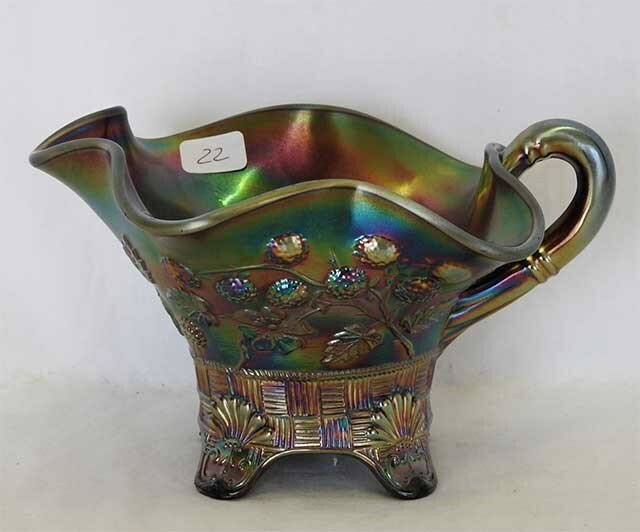 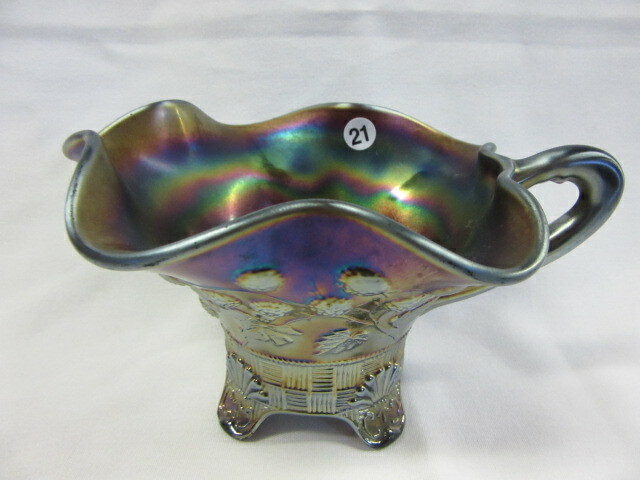 The gravy boat, or occasional piece, on the right, is one of the few of these shapes found in Carnival Glass and the only Northwood one. 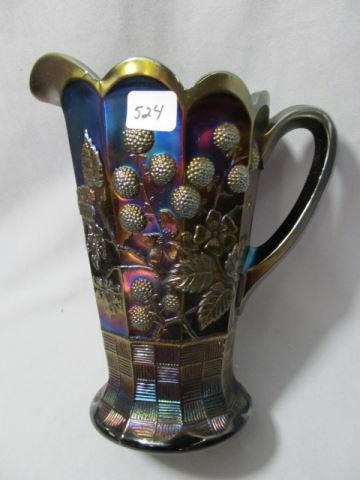 Curious that Northwood chose to put it in this pattern rather than, say, the more extensive Grape and Cable.